TORONTO, Oct. 30, 2017 /CNW/ - RNC Minerals (TSX: RNX) ("RNC") is pleased to announce that Orford Mining Corporation (TSX-V: ORM) (55% owned by RNC) has commenced trading on the TSX Venture Exchange (the "TSXV") under the ticker symbol "ORM". RNC is also pleased to announce that Orford has reported the results of its Summer 2017 exploration program on the Qiqavik property in northern Quebec, as outlined below. Mark Selby, President and CEO of RNC, commented, "I am very excited that this final step in the spin-out of RNC's former exploration assets into Orford Mining Corporation has now been completed and that Orford is now trading on the TSXV under the symbol "ORM". The results from the 2017 exploration season at Qiqavik include three new drill-supported high grade gold discoveries and five new high-grade gold prospecting discoveries at surface that remain untested by drilling. Orford also identified a significant structural break, the Qiqavik break, across the 40 km property, a substantial portion of which is left to be explored." Note that grab samples are selective by nature and values reported may not be representative of mineralized zones. Also note drill intervals reported in this press release are down-hole core lengths as true thicknesses cannot be determined with available information. The 2017 summer exploration program at Qiqavik consisted of 2,723 metres of diamond drilling in 23 holes (Table 1), 721 line-kilometres of airborne (drone) magnetic surveying, 105.6 line-kilometres of Abitibi Geophysics ground OreVisionTM IP surveying, prospecting, mapping, surface rock sampling, and till sampling (Figure 1). Details of the work program are available in the 43-101 Technical Report on the Qiqavik Property filed under Orford's profile on SEDAR and on Orford's website. This work has led to the better understanding of the surface occurrences discovered in 2016 and to the identification of many additional mineralized occurrences on the property. Gold and multi-element assay results have been received for the drilling and surface sampling programs with the exception of multi-element results from holes QK-17-017, -019, -020, -021, -022, -028 and -029, and 116 grab samples. These assays are pending and are expected to be received and published in early November. A summary of significant assay results from the drilling program and surface sampling program are presented below. A table of complete results can be accessed at Table 3. Note that grab samples are selective by nature and values reported may not be representative of mineralized zones. Also note drill intervals reported in this press release are down-hole core lengths as true thicknesses cannot be determined with available information. Drilling has supported the subsurface extent of the structures and the Au and Au-Cu-Co mineralization associated with the 2016 surface gold discoveries at Esperance, Esperance West, and Aurora. Work completed during the 2017 program demonstrates that gold is associated with secondary splay structures located along the district-scale Qiqavik Break Shear Zone which extends the full 40 km length of the Qiqavik Property. Geological data indicate that gold mineralization at Qiqavik is structurally controlled and associated with porphyry intrusions in places. Typically, in structurally controlled gold deposits, the intensity of mineralization varies along the length of the structures with ore shoots focused in zones of dilation. Orford is currently analyzing airborne magnetic and field mapping data collected during the summer 2017 program to identify and locate sites of dilation along structures that were active at the time of gold mineralization in order to target significant gold mineralization accumulations. The Qiqavik Break is part of the Cape Smith Belt event which is of Paleoproterozoic age (1.8-1.9 billion years). This geologic era is marked by its significant metal endowment as illustrated by the important gold districts that occur worldwide related to geological events of Paleoproterozoic age. These include the Flin Flon-Snow Lake Belt, the Ashanti Gold Fields of West Africa, the Tapajos-Parima Belt of Brazil, and the Tanami Region in Australia. Note that drill intervals reported in this press release are down-hole core lengths as true thicknesses cannot be determined with available information. NA indicates that results are not available as they have not yet been received from the lab ; blank values are not significant. 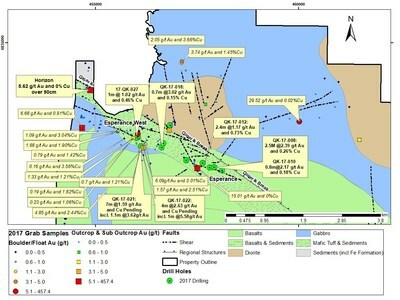 At Esperance, drilling has outlined two Au-Cu-Co sulphide-rich mineralized zones, Esperance and Esperance West, that extend over a known strike length of 300m and 650m respectively (Figure 2). Results include 2.39 g/t Au, 0.26% Cu over 2.5m in QK-17-022 at Esperance and 2.63 g/t Au, (Cu pending) over 4.0m including 5.58 g/t Au, (Cu pending) over 1.0m in QK-17-008 at Esperance West. Multiple porphyry dykes were observed in the core at Esperance which may be related to mineralization. The polymetallic mineralized trend continues West of Esperance along the Qiqavik Shear Zone where the new Horizon discovery has yielded 5.67 g/t Au over 0.9m in a channel sample at a distance of 1.0 km from the Esperance West drilling. Note that grab samples are selective by nature and values reported may not be representative of mineralized zones. NA indicates that results are not available as they have not yet been received from the lab; blank values are not significant. Sub-outcrop samples are taken from frost-heaved blocks that have been detached from the bedrock, but are still in place above their bedrock source. Boulder fields are extensive areas of angular boulders of the same lithology. 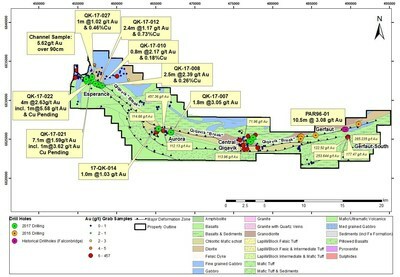 At Aurora, drilling has intersected two quartz vein hosted gold mineralized zones, Aurora and Aurora West, separated by 1.6 km (Figure 3). Results include 2.55 g/t Au, over 2.2m including 13.68 g/t over 0.30 m in QK-17-009 at Aurora West, and 3.05 g/t Au over 1.8 m including 4.93 g/t Au 1.0m in QK-17-007 at Aurora. 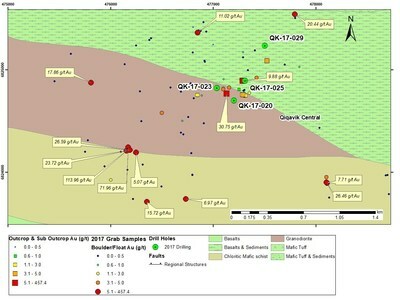 Approximately equidistant between these two zones, at Central Aurora, prospecting has yielded a new discovery of quartz veins with galena mineralization occurring along a West-Northwest shear zone. Sub-outcrop samples from this zone containing visible gold include samples grading 457.4 g/t, Au 114.7 g/t Au and 112.1 g/t Au. 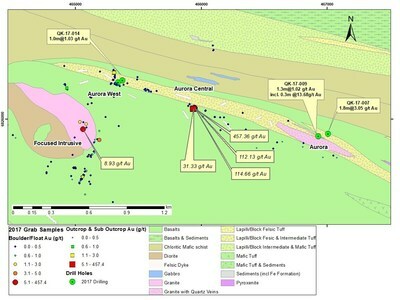 Additionally, to the south of the main Aurora trend, many quartz vein boulders of proximal source containing polymetallic sulphide mineralization were discovered at the eastern contact zone of the Focused Intrusive. The mineralization and structures indicate multiple void filling events by mineralized fluids in an extension system. 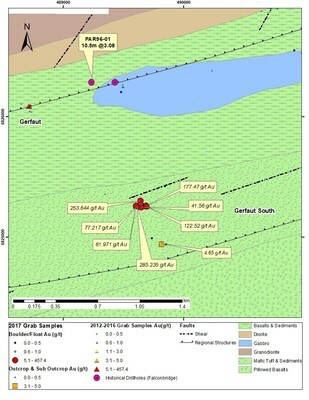 Assay results from grab samples from this area include 8.93 g/t Au and 4.25 g/t Au. This discovery was made in the last two days of the 2017 program. Initial drilling on structures at Central Qiqavik have yielded strongly altered shear zones with anomalous gold (up to 0.26 g/t over 3.0 m and 0.34 g/t over 1 m in QK-17-023) (Figure 4). Concurrent prospecting and mapping at Central Qiqavik in 2017 has led to the discovery of multiple new mineralised trends defined by high-grade surface grab samples over a 2.5 km by 2.5 km area including individual zones with samples grading up to 113.96 g/t, 24.46 g/t, 17.86 g/t and 20.44 g/t respectively. Follow-up of these discoveries will focus future targeting on the most prospective areas of Central Qiqavik. Prospecting in the Gerfaut Area has led to the discovery of multiple angular boulders containing visible gold in the Gerfaut South Area. Grab samples from these boulders have yielded high-grade gold values including 285.24 g/t, 253.64 g/t, 177.47 g/t and 122.52 g/t (Figure 5). These boulders occur 1 km southeast of and up-ice from the historical drill intersection of 3.08 g/t Au over 10.5 m in PAR96-01 and therefore likely represent a different source. Glacial transport is toward the NNE, and due to the proximity of the glacial divide field data suggest limited distance (50 to a few hundreds of metres) between the source of gold-bearing mineralization and boulders and related geochemical anomalies detected in till. The disclosure of scientific and technical information contained in this news release has been approved by Alger St-Jean, P. Geo, Vice President, Exploration of RNC Minerals, a Qualified Person under NI 43-101. The work program at Qiqavik was supervised by Michelle Sciortino, Senior Project Geologist who is responsible for all aspects of the work, including the quality control/quality assurance program. On-site personnel at the project log and weigh all samples prior to sealing and shipping. Sample shipments are sealed and shipped to Techni-Lab, Sainte-Germaine-Boulé, Québec. All gold assays reported were obtained by either 350-g screen fire assay or standard 50-gram fire-assaying-AA finish or gravimetric finish (method 1A2-5 and 1A3-50) at. The 350-g screen assay method is selected by the site geologist or the lab when samples contain coarse gold or higher percentage of sulfide mineralization that may be associated with gold relative to surrounding intervals. All samples are also analyzed for multi-elements, including copper and silver, using a four-acid method with an ICP-EOS and ICP-MS finish at Techi-labs affiliated Actlabs in Ancaster, Ontario. Overlimits were analyzed by peroxide fusion with ICP-EOS finish. Drill program design, Quality Assurance/Quality Control ("QA/QC") and interpretation of results is performed by qualified persons employing a QA/QC program consistent with NI 43-101 and industry best practices. Standards and blanks are inserted at a minimum of 10% and 5% for core and grab samples respectively for QA/QC purposes in addition to those inserted by the lab. A subset of samples has not yet been sent for a verification assay at another lab. Techni-Lab Laboratory, is a subsidiary of Act Labs, is accredited (n. 707) by the Standards Council of Canada and found to comply with the requirements of ISO/IEC 17025:2005 (CAN-P-4E) and CAN-P-1579. This news release contains "forward-looking information" including without limitation statements relating to the liquidity and capital resources of RNC, production guidance and the potential of the Beta Hunt and Reed mines as well as the and the potential of the Dumont development project and Qiqavik, West Raglan, Jones-Keystone Loflin and Landrum-Faulkner exploration properties. Forward-looking statements involve known and unknown risks, uncertainties and other factors which may cause the actual results, performance or achievements of RNC to be materially different from any future results, performance or achievements expressed or implied by the forward-looking statements. Factors that could affect the outcome include, among others: future prices and the supply of metals; the results of drilling; inability to raise the money necessary to incur the expenditures required to retain and advance the properties; environmental liabilities (known and unknown); general business, economic, competitive, political and social uncertainties; accidents, labour disputes and other risks of the mining industry; political instability, terrorism, insurrection or war; or delays in obtaining governmental approvals, projected cash costs, failure to obtain regulatory or shareholder approvals. For a more detailed discussion of such risks and other factors that could cause actual results to differ materially from those expressed or implied by such forward-looking statements, refer to RNC's filings with Canadian securities regulators, including the most recent Annual Information Form, available on SEDAR at www.sedar.com.